It was about time that one of the boys was profiled on Monday Muse, and who better to start with than one of fashion's most iconic figures; the luminary Marc Jacobs. From designing for his namesake labels, to creating sumptuous blends of fragrance for his perfumes and taking the creative helm at Louis Vuitton, one would be crazy not to wonder when exactly Marc Jacobs takes time to himself! For now though, it seems riding the fashion wave of success is right where he should be. Sofia Coppola, a personal friend of Jacobs notes that; "I feel like he just doesn't take it all-or himself-too seriously, but then can make these really beautiful, high-luxury things. Those two qualities are usually not contained in one person." Peter Copping further comments that; "He is just a simple, ordinary guy." Both sentiments are credit to Jacobs' character and ultimately account for his extensive appeal. Despite a troubled upbringing, Jacobs still successfully managed to receive an education, at Parsons School of Design and received numerous awards during his time there. Since the mid 1980's he has been involved with the Fashion world in one way or another, and it is his overhaul of the Louis Vuitton brand, featuring memorable collaborations with the likes of Stephen Sprouse and Takashi Murakami which he is recognised for among those who aren't necessarily in fashion circles. "To me success is not a fait accompli. Next season, if we do something they like more, they'll say, Yeah that carousel show, you know, it was nice, but it was so sweet and it was so pretty. And you know that's just the way it goes." 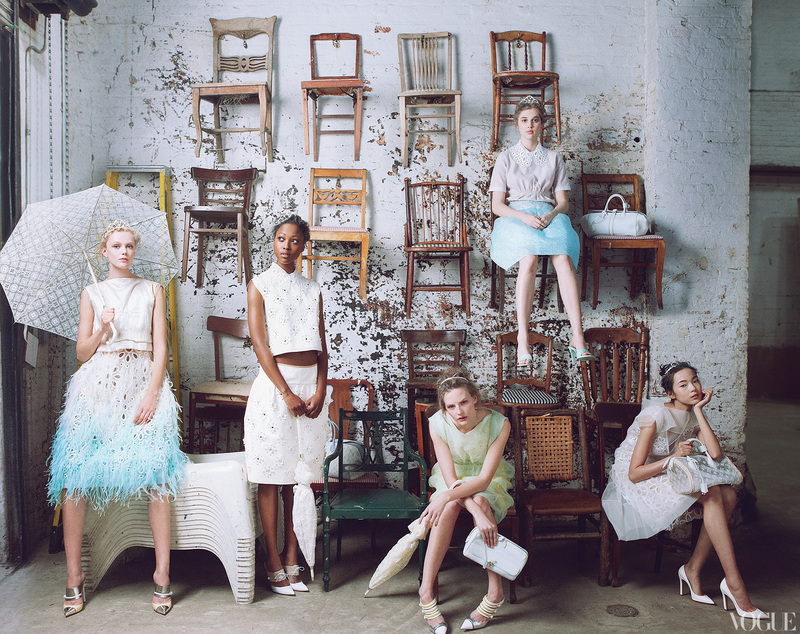 Portrait of Marc Jacobs & Models in Jacobs' designed pieces from Vogue US, January 2012. From the Daisy, Marc Jacobs perfume campaign shot by Juergen Teller.